Just because the holidays are over, doesn’t mean you have to stop eating cookies altogether. Especially when breakfast cookies exist! Oh, yes friends. You can enjoy plenty of these sweet treats without the guilt. This recipe is refined sugar-free, packed with cranberries, and sprinkled with a healthy dose of nuts and seeds. Consider it fuel for tax season. You might recall the original breakfast cookie, found here. This recipe is an updated version. And I can’t stress enough how incredibly DELICIOUS they are! Plus, they’re super easy to make. All you need is 5 minutes of prep time and 12 minutes in the oven. This is a relatively new product from Trader Joe’s (surprise!). Initially, I thought I’d sprinkle it over oatmeal and yogurt, but it adds great texture to baked goods as well- it’s nice and crunchy. What I love most about this blend is that it contains ‘sprouted’ grains which is especially beneficial for the digestive system. Sprouted grains help to break down the naturally occurring anti-nutrients our bodies have difficulty digesting (i.e. gluten). Don’t you feel healthier just reading all that? Once the dough is ready, use a mini ice cream scoop to portion the mixture onto sheet pan- it’s so much easier than struggling with two spoons. The texture of these cookies is crunchy with a soft center. They’re lightly sweet. And because of the moisture from the dried cranberries, they become softer on the second day. My mom says these are the best healthy cookies she’s ever tried. 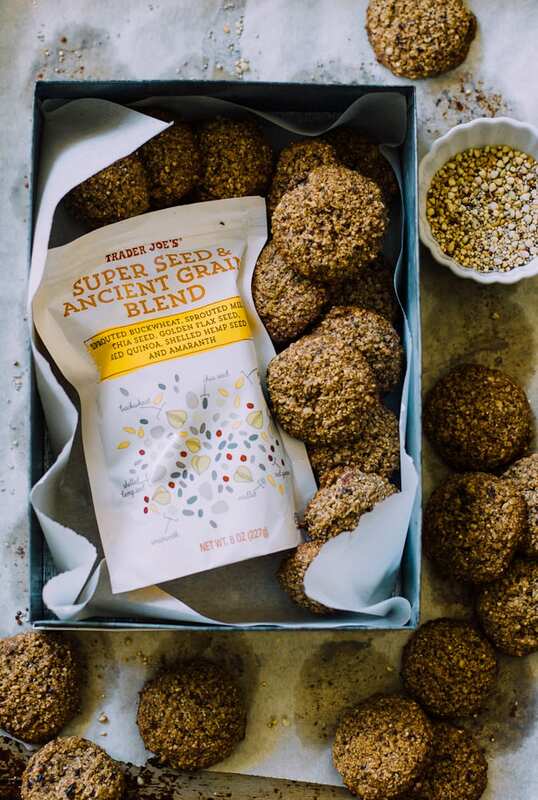 You don’t need to run out and buy Trader Joe’s super seed & ancient grain blend to make this recipe. Simply substitute some of your favorite choices (i.e. flax seed, hemp seeds & quinoa). Just keep the total measurement the same. Swap out dried cranberries for tart dried cherries, blueberries, or raisins. When shopping at the store, you’ll find both almond meal & almond flour. Almond flour is made with blanched, skinless almonds and is pale yellow in color. Almond meal is processed with the skins and is darker in color (think: white sugar vs. brown sugar). You can use either one for this recipe. I chose almond meal because it’s less expensive. Enjoy these cookies anytime of day, not just for breakfast! They make minimal crumbs too, so you can eat them in the car. *Note: In the grocery store, you'll find both almond meal & almond flour. Almond flour is made with blanched, skinless almonds and is pale yellow in color. Almond meal is processed with the skins and is darker in color (think: white sugar vs. brown sugar). You can use either one for this recipe. I chose almond meal because it's less expensive. ** Because quick oats and almond meal vary from brand to brand, they will absorb liquid at different rates. I run into this issue all the time when I make homemade bread. To get your cookies to spread, add water (1 tbsp at a time) to loosen up the batter. Add the quick oats, almond flour, mixed seeds, pecans (if using) cinnamon, and baking soda to a food processor. Pulse until the oats look like 'flour.' It's okay to have a few big pieces in the mix. Add the egg, coconut oil, maple syrup, vanilla extract and 1 tbsp of water. Process to combine. If the dough is too stiff, add the remaining 1 tbsp of water to loosen up the batter. This way, the cookies will spread when baked. Repeat this step as needed. Alternatively, if the batter is too runny, just add a sprinkle of almond flour or oats to combine. Add the cranberries and pulse a few more times. I LOVE the sound of these cookies! So many yummy seeds in there! I looooooove your original breakfast cookies, so I will have to try these! It really is easy. I’m wondering, can these be frozen? WIll be looking for those seeds at Trader’s. Hi Ruby! Thank you! I’m so glad you enjoyed them. They really are super simple to throw together. You know, I haven’t had a chance to freeze these cookies yet because they boys devour them too quickly! I imagine it would be perfectly fine. Here’s what I would do: freeze the dough (in balls) directly on a lined sheet pan or tray, whatever your can fit in the freezer. Then transfer the dough to a ziplock bag. Bake from frozen adding a few extra minutes, if necessary. These sound amazing and isn’t TJ’s the best? Can you tell me approximately how many these make? Can’t wait to try them! looks amazing! can’t wait to make these! Yum! Wonder what you are calling almond meal. I have almond flour. Not the same thing? Hi Mary! Sometimes the two terms are used interchangeably. And for this recipe, you can use either one. Oh I love this. Will make them this weekend. I bet they are also a great snack for the younger bundles of energy in our house. My son loves seeds (and cookies, of course), so this will be a hit for him. Thank you Emily! I certainly don’t plan to stop eating cookies ;). These are the perfect breakfast! Yay! Yours were so beautiful, Jessie! I loved the spin you put on them. Delish. those cookies look delicious. unfortunately, I don’t have a food processor. Do you think I could mix by hand if I substituted oat flour for the oats? Jacquie, you can definitely use oat flour as a replacement. And, if you have some quick cooking oats lying around, you can swap out 1/2-1 cup of the oat flour for oats. This will add nice texture to the cookies. Then follow the recipe, mixing by hand. Oh and one more thing- you might want to give the cranberries a rough chop before folding them in to the dough. Those cookie look like something I would absolutely love…and truly without any guilt. Although I do suppose moderation is really key in everything, right? :) Such a lovely blog you have and happy to have found you through Celia’s blog. These were so yummy Emilie! I thought about them all weekend and finally got my act together to make them for the boys as an after-school snack yesterday afternoon. They were gobbled up to rave reviews (my biggest challenge was saving a couple for my husband’s return from work). My youngest said the texture reminded him of scones so he thought your title of ‘breakfast’ cookie was very appropriate :) I too loved the texture and thought the maple flavour infused beautifully. I made a couple changes to suit what I had on hand, this is a very adaptive recipe which is also helpful. So tasty and full of goodness, thank you. I made these cookies this weekend, and they are sooooo yummy. No almond meal or flour to be found at my local Trader Joe’s (all out), but I spotted a bag of coconut flour. Who knew it even existed….not me! So, given that coconut oil is one of the cookie ingredients, I took a chance. Perfect. No overpowering coconut flavor and the cookies baked up beautifully. I have been enjoying them with my morning coffe and as an afternoon snack at work when that mid-afternoon slump hits. Thanks so much. I am really enjoying your lovely blog and look forward to spending more time in my kitchen with your recipes. Victoria, thank you so much for stopping by with your feedback. I really do love when people make my recipes. I also use TJ’s coconut flour. Do mind telling me how much you used as a substitute? I’d like to try it out! I do know that coconut flour can be unforgiving if used with a heavy hand ;) So happy to hear that you are enjoying the cookies! I used the same amt as the almond flour – 1/2 cup. I may use a little less next time, as my batch are probably a little dryer than they should be. Figured it was my oven (seems to run a little on the hotter side) or I left them in a little too long. Thanks for the tip about the coconut flour…will remember that for next time. Oooh, I love these photographs, and heaven knows I could do with eating in a more healthy fashion. I am intrigued by these cookies, and I will have to give them a try. I have just one question – are you sure you can not help me with my taxes? I missed so many delicious posts of yours because my computer was on the blink. Argh! don’t you hate it when that happens. I’ve had a tab open in my browser since the day you posted this, and have kept meaning to come back to it. I guess that’s a good measure of how hectic things are at the moment, hah! I have major goals for the coming weekend to (finally!) make your breakfast cookies and to relax. I absolutely love how these sound! I am the most voracious snacker and am constantly looking for new, yummy ways to switch it up. I’d love to have one of these for breakfast, then a few more two hours later when my tummy is growling again! Followed recipe and ingredients exactly and these did not spread like the photos. They’re delicious and not too sweet… but they stayed the shape of the mini cookie scoop just a bit more plump. Any tips? Okay, so I made another batch this morning. Here’s what’s going on: because quick oats and almond meal vary from brand to brand, they will absorb liquid at different rates. I run into this issue all the time when I bake homemade bread (King Arthur flour needs more liquid than Gold Medal brand). To compensate, the batter needs extra liquid in order for the cookies to spread. Try adding 1-2 tbsp of water to the batter to make it more ‘runny.’ This is what I did, and they spread nicely and came out soft with crispy edges when baked for an extra minute. Water seems to do the trick better than adding additional maple syrup. Keep in mind, you will have to play around with the exact quantity of water to get it to your liking, adding a little bit at a time. I’ve updated the recipe below with my changes! Hope this helps! And thanks again for bringing this to my attention! Hi-I only have old fashioned oats at home. Can I use that? I use quick oats because they absorb liquid better than old fashioned oats. I haven’t tested this recipe with the later, but you can certainly try! That being said, you might want to make adjustments with the liquid as you go depending on what the dough looks like. Hi there! Unfortunately I don’t. I bet you could plug the info into an online converter? That might help! These are the best cookies I have ever had, and so easy! Thanks! Looks great! Can I use the gluten free oats from trader joes by chance? Do kids like these? always looking for a yummy healthy breakfast for them and myself :). Hi Rachel! I shop at TJ’s all the time ;) I haven’t tested this recipe with GF oats, but it shouldn’t make a difference. I only use quick oats bc they absorb liquid better. 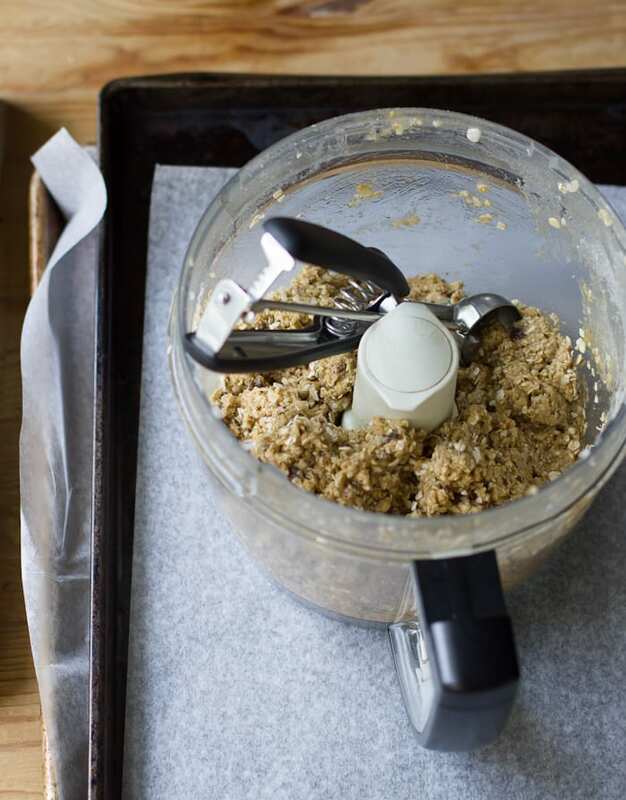 So, to achieve similar results with GF rolled oats, you might want to process the oats separately to break them down a bit more before adding the wet ingredients. As for kids, my boys LOVE these cookies. I made a batch this morning, actually (but they were the original version- see link above). They’re not very sweet and perfect to give them in the car for busy mornings ;) Have fun with the recipe! These are DELICIOUS! Because I live close to a TJ’s I actually did run out just to buy the blend and I’m so glad I did. It was super easy to toss in and gave te cookies a lovely, nutty little crunch! You know a healthy cookie is good when a 2 year old eats it and asks for more – which is exactly what happened in my house. I always have a hard time finding dried cranberries without sugar added, so I found (at TJ’s no less!) dried dark cherries and dried wild blueberries, both without sugar – they were SO GOOD added to these!! TJ’s also makes an Ancient Grain and Super Seed Oatmeal. It was a gamble on my part to buy it – no one in my family liked it! Thanks goodness for this recipe. I used up the bag and that took care of the oatmeal and grain/seed mix in one go. I had some cacao nibs on hand, so I added those instead of pecans. It turned out wonderfully! Thanks for the recipe! 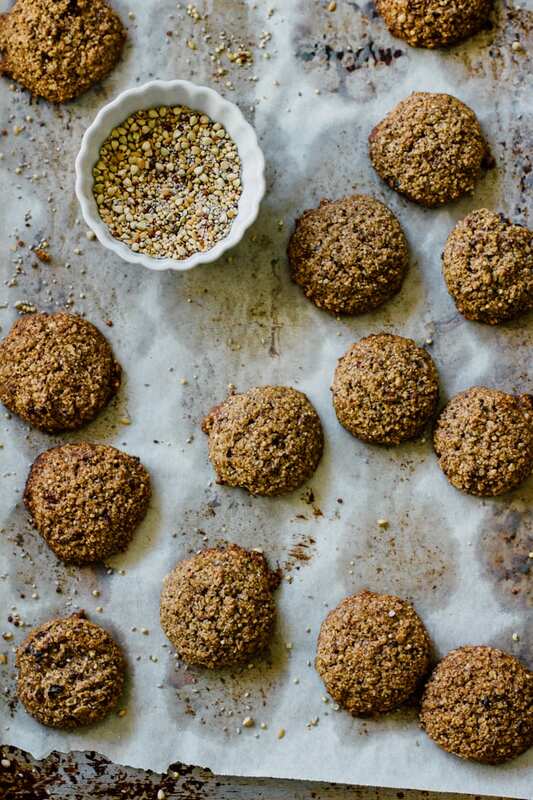 I found your blog through this recipe and have to tell you that these cookies are a game changer in the morning! 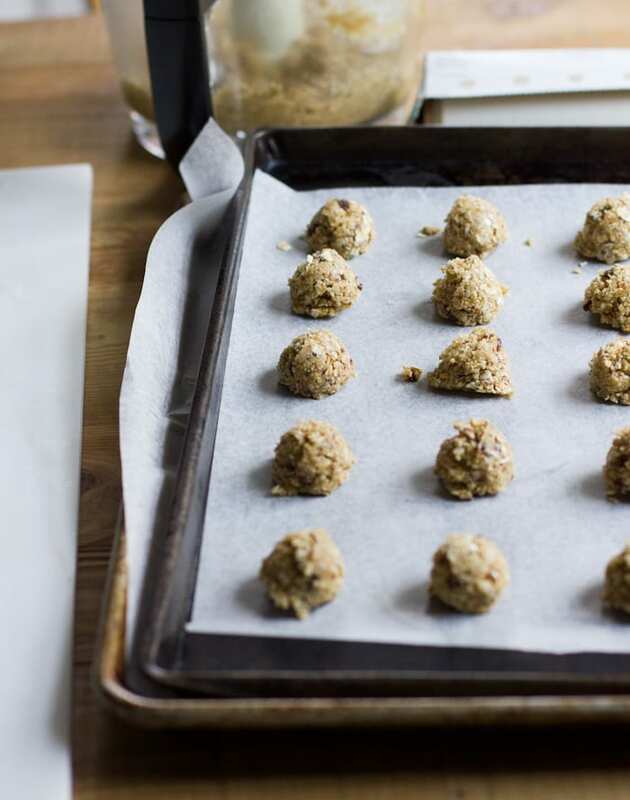 I make them often and have free-formed a few times (added banana instead of egg to make them vegan), added almond butter, dried coconut, pumpkin seeds – they are so versatile and SO delicious! When they hang around for a few days, I notice that they get a bit crumbly so I put them in the freezer and have to say that they taste GREAT frozen (my 17-year old daughter’s favorite way to eat them.) THANK YOU!! Hi There! This recipe sounds awesome – but I’m trying to reduce cholesterol so I’m going to need some substitutions. Have you tried applesauce? Also – do you use the quinoa and other seeds right out of the box? Emilie! I’m making these again for the third time and have to tell you how much I love them. I always need to add a little more almond flour (that’s what I have on hand most of the time), and I love adding dark chocolate along with dried crans or cherries. Hope you’re doing well – thanks for making this upcoming week a good one for me because of these breakfast cookies! XO!